If you like bitter drinks, then you’ll really like today’s drink. The drink was developed by a lounge band of the same name back in the early 90’s. I can’t vouch for group’s music, but the drink is pretty good. The Combustible Edison combines extreme bitterness with – you guessed it – fire. And while bitterness and fire might seem like an unbeatable combination, there is one downside. 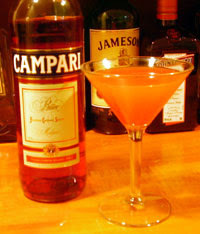 Given the fact that Campari is so uncommon, you may have to substitute Angustura bitters. The drink isn’t bad that way. The difference is that Angustura is much more powerful, and has more of a "clove" taste, whereas the Campari is more of a fruit taste (which is why Campari goes better with the Brandy). Ok, now let's make the drink. Room temperature Brandy doesn't usually catch on fire. So, take the 2 oz of Brandy and pop it in the microwave for about 20 seconds. Depending on your microwave, this will bring it to just below the boiling point – which is perfect. While that's warming up in the microwave, shake the lemon juice and the bitters in a shaker with ice and strain into a cocktail glass. Now, take the shot of brandy out of the microwave and light it on fire just as you pour it into your cocktail glass. Depending on how you pour it, the fire will probably go out almost immediately when you pour it in the glass. But if you are careful about it, you can "float" the brandy on top and it will burn with a really nice blue flame (you may have to turn the lights out if you can't see it). If you don't feel comfortable lighting your drinks on fire, or you are religiously opposed to burning the alcohol out of your drink, then you can just skip the fire part. In that case it’s a Flame-retarded Edison. Add all ingredients to a cocktail shaker and shake well. 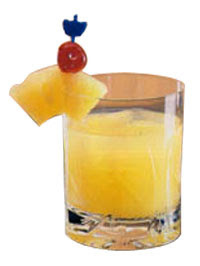 Then pour into a Collins glass and garnish with fruit slices. Directions: Shake it in a Cocktail Shaker with ice, Strain into a salt-rimmed cocktail glass. 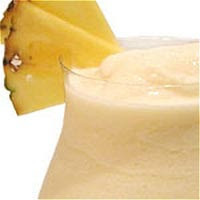 Who doesn’t enjoy a nice cold Pina Colada on a hot day? The drink was developed in Puerto Rico in the 1950's and became popular in the States during the '70s. 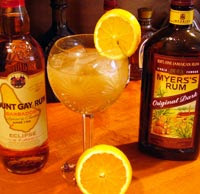 Today it has a bit of a "Retro" flavor – or maybe that's just the Rum I taste. 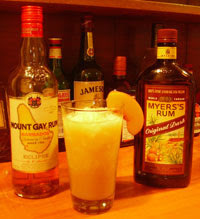 Traditionally the drink is shaken, not blended. And while I usually try and do things the "traditional" way – I gotta say that when it comes to Pina Coladas, mine are blended. 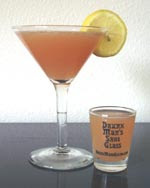 There are Thousands of Cocktail Recipes at the Drunk Man's Guide!